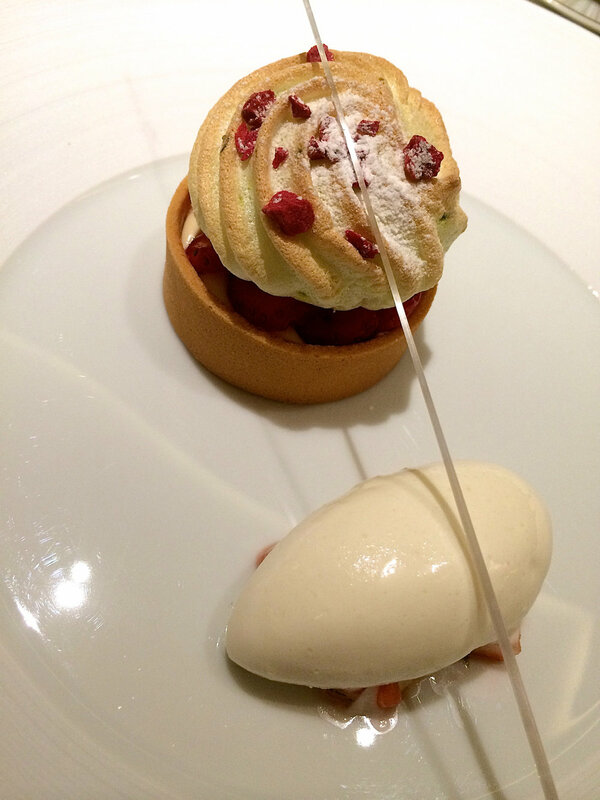 It is close to impossible to find a table at the newly opened three star Michelin restaurant L’Osier in Ginza. Even after requesting a table a month before, we only managed to snag a table for lunch and that was in their private room. So we had to summon a group of 8 people to accompany us for lunch last week. The interior of new L’Osier Ginza is subtly grand and I loved the cream-colored interior. Here is a picture I snatched from their website. I was expecting their service to be somewhat formal and stuffy but was pleasantly surprised by the warm and hearty welcome. Lionel who served us, spoke perfect English and took great care of every detail throughout our lunch. I was really hungry and did not feel like drinking champagne on an empty stomach so he sent me some lovely nibbles. Followed by a lovely mushroom custard. A sea urchin and shell fish custard with an egg shell broth flavored with saffron followed. Next, came a sea bass fillet encased in bread with grapefruit juice served with mint flavored zucchini puree. I have never been much of a grapefruit fan and found this dish to be a little sour, but most of my other friends liked it. Next course was a slice of beef cheek, glazed beetroot and turnips with carrot puree and cumin moose. The beef cheek was wonderfully soft. A fresh pre dessert sorbet followed. The dessert was a lovely creme brûlée, flavored with orange blossom, cottage cheese and lemon ice cream. And to end things on a sweet note, some lovely little delights from the sweet delicacy trolley. It was truly an extraordinary elaborate lunch which will throw you back about 14.000 yen excluding drinks but well worth it!.